I started the month with a review of a 10 yo whisky that is only available in a few markets (the Highland Park 10); here now is a review of a 10 yo whisky that is available everywhere: the Macallan 10 from the distillery’s Fine Oak line. 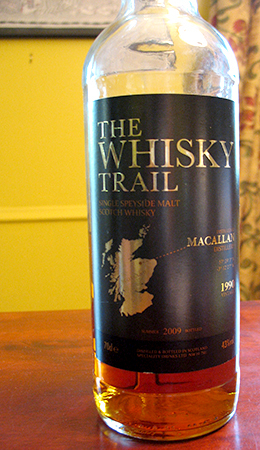 This line was launched in 2004 as Macallan tried to make us forget that for a long time they had tried to get everyone to agree that heavily sherried whisky was where it’s at: the Fine Oak line features whisky vatted from sherry and bourbon casks. I’m sure that at the time the distillery would have said that this offered customers another exciting view at the nuances of the Macallan character; and I’m sure that if I’d been blogging then I would have remarked that it probably also offered the distillery an opportunity to constrain and allocate its heavily sherried stock for more expensive releases (or maybe that’s with the benefit of hindsight). Following my review of the Glenfarclas 105, here is another cask strength, sherried beast from the Speyside: this time the Macallan CS (I actually tasted it right after the 105). I believe this has been discontinued. I’ve finished a couple of bottles of this over the years and have always liked it. I expect I will again as this is from a 2010 bottling (which was probably what my last ex-bottle was as well—my spreadsheet says I finished it in December 2011). Of course, these days a lot of Macallan’s whisky is NAS but it’s now mostly all colour-coded as we’re all apparently children. And I don’t think they put out any official cask strength whisky anymore. 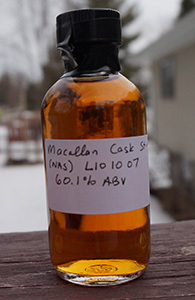 This is a somewhat unusual Macallan as it is from a single bourbon cask. Macallan’s own We’re Running Out of Sherry Casks and Need to Change Our Story Fine Oak series, of course, includes ex-bourbon whisky in the vattings but I’m not sure if any of those are from only bourbon casks (the labels all say “Triple Cask Matured”). At any rate, it’s the only Macallan I’ve had that I know to be from only bourbon wood. Now I wait for my readers to tell me that in Belgium and Austria only bourbon cask Macallan has ever been available. The Macallan is one of the most recognizable single malt whisky brands among non-whisky geeks, and the owners have spent a lot of money and time building up the name recognition and the premium associations. 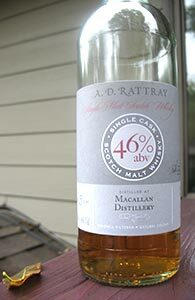 It is partly for this reason that many whisky geeks recoil from the Macallan, I think. I know I feel a kind of reverse snobbery about the distillery that Michael Jackson described as “the Rolls Royce of single malts”, but which has come to be more like the Lexus of single malts. But just as Lexus actually makes fine cars, Macallan makes fine sherried whisky. If I am to be honest I have to admit that the Macallan 12 of the early-mid 2000s was one of the malts that made me fall in love with single malt whisky, and I do enjoy the (fast-disappearing) Macallan CS as well, which is perhaps the rare Macallan which can be described as a good value these days. The older Macallans I cannot afford, and the reports I have of them do not make me aspire to afford them.